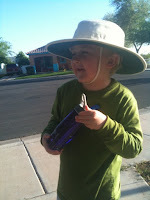 Check out the album of Julian sporting his new Tilley hat. Seems like it's been forever since we posted anything new to Julian's blog. Overall, Julian is doing great! All three of us are at the tail end of some kind of respiratory/flu bug that seems to have been nagging us for over a month, but hopefully we're at the tail end of it now. It's good to know that Julian can weather that kind of ailment, even on immune suppression. Since last post, one of Julian's docs from Palo Alto moved to the University Medical Center in Tucson, so we take him down there for his quarterly appointments now. Nice, since some of our dearest friends live in Tucson, and it gives us the chance for a visit, at least once a quarter. Check some of our family photos here. 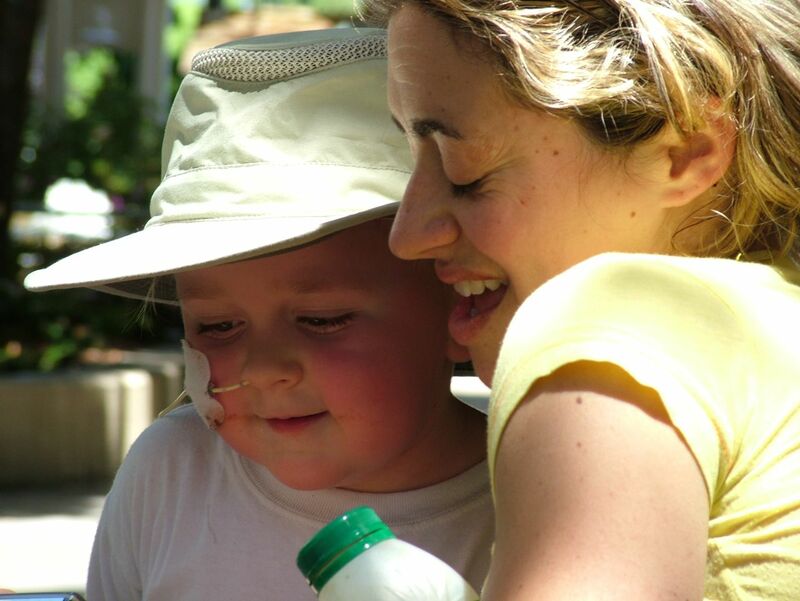 You can also check some pics from Julian's biopsy trip last May here. We'll try to post more frequently, especially pictures & videos, so you too can watch Julian grow up! Julian went in for biopsy, and the Docs were unable do it: the organ was surrounded by liver and bowel, such that they were unable to get an unobstructed point of entry into the kidney. The Doc in charge "rolled him every which way" to try to line up a clean shot, but in the end decided it wasn't worth risking a punctured bowel to get a tissue sample. So they didn't even insert the needle. If Julian's condtion were anything less than stellar, or if he were in rejection, they probably would have gone for it. But because he's doing so well, and because this is only a scheduled protocol biopsy, it's acceptable to skip it. We're happy with the decision, because a) it's indicative of Julian's overall great condition, and b) the follow-up care on our end is a hardship on all parties involved. "No running or jumping for two weeks following the biopsy." Really? That's pretty much all he does right now. So, now that Julian has recovered from anasthesia, our goal for the day is to get him fed and rehydrated. This weekend we'll take it easy. Monday we have a follow-up with the Docs to talk about where we go from here, followed by a fluoroscopic study on J's bladder to check for signs of reflux and overall bladder health. After that, the drive home. Thanks to all of you who prayed for us. Julian did great today, recovered well from the ordeal, and we pray that he'll continue to do well for years to come. Hey all - Julian's 2-year post-transplant biopsy is today. We check him in to the day clinic at Lucile Packard Children's in about an hour and a half (8:30 a.m.). It's an all-day event, mainly because Julian has to lie still for eight hours (!) post-procedure (to give the blood clot resulting from the biopsy time to form). Great day yesterday: Dr's appointments and an ultrasound, followed by dinner at the Ferry Building in San Francisco. A nice break. Please pray all goes well today. I'll be posting updates to Twitter as the day progresses. Follow along at www.twitter.com/dphillips for updates. Long time, no post. 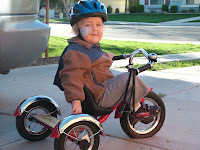 We're back in Palo Alto for Julian's two year post-transplant biopsy. Julian is doing great, and we can hardly believe it's been so long already since the kidney transplant! God has been good indeed. Checked in yesterday at the Ronald McDonald House. This morning, a marathon Dr's appointment, followed by an ultrasound this afternoon. Tomorrow, the biopsy itself. Then the weekend to recover. On Monday, follow-up clinics in the a.m., then a fluoroscpic study to check on the state of his bladder/kidney connection on Monday afternoon. After that, the long drive home. It's been a good, albeit exhausting trip so far. Pray for a successful procedure, and safe travel home. Will post more as the weekend progresses. Happy Thanksgiving everybody! It's been a while since we've posted anything to the blog, but no news is good news. Julian is doing great! We're working on the annual newsletter, hoping to get them in the mail sometime next week. Once we have the final draft, we'll make it available electronically as well. Julian woke up this morning a bona fide five-year-old. He's quite pleased with himself, and already making plans for what he'll do when he turns 6. It's amazing watching little ones grow up. It seems to happen in big steps, like certain things falling into place or a switch is turned on, and one day he wakes up with the wit to negotiate for extended bed-times, make plans for the future, and crack jokes all on his own. It's so much fun being Julian's parent! One of the things Julian has become acquainted with this year is Star Wars! 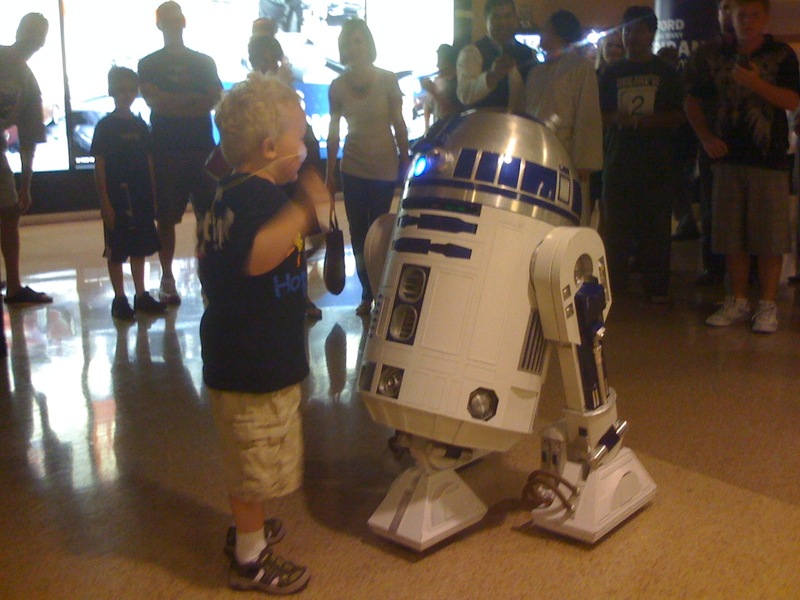 In particular, he likes any scene where R2D2 (pronounced "oo-dee-doo-dee") is present. 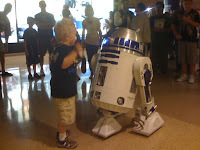 We were quite pleased to find out a couple weeks ago that Hopekids.org had tickets for us to go see Star Wars On Stage, a spectacular hi-def multi-media arena show, complete with live orchestra playing the iconic Star Wars themes, and narrated live (!) by Anthony Daniels, the gentleman who played C3PO in the saga. What a show! But the highlight had to be when we were roaming the halls, and who should we bump into? Oo-dee-doo-dee! What a thrill! Turns out Oo-dee-doo-dee is as big as Julian, and was as happy to see Julian as Julian was to see him, spinning and rolling around, and looking Julian in the eye! Wish we had it on video. We're laying low today, and will have a small, family celebration this weekend. Julian has received some very thoughtful packages from family members near and far, and we'll enjoy opening those this weekend. One of the things that has become something of a birthday tradition for us is these crazy "ugly dolls" (that's really what they're called), and we've taken to giving Julian one every birthday (starting when he turned 1). This year he got 2 new friends - 3 if you consider the big one in the picture is actually 2-sided (named "bop & beep"). We let Julian open those as soon as they arrived in the mail, and as you can see, they've bonded well already. Well, it's been a while since our last post. 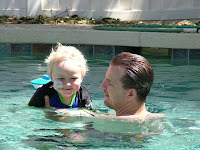 We've enjoyed a nice, hot summer here in Gilbert, AZ, and overall, Julian is doing great! 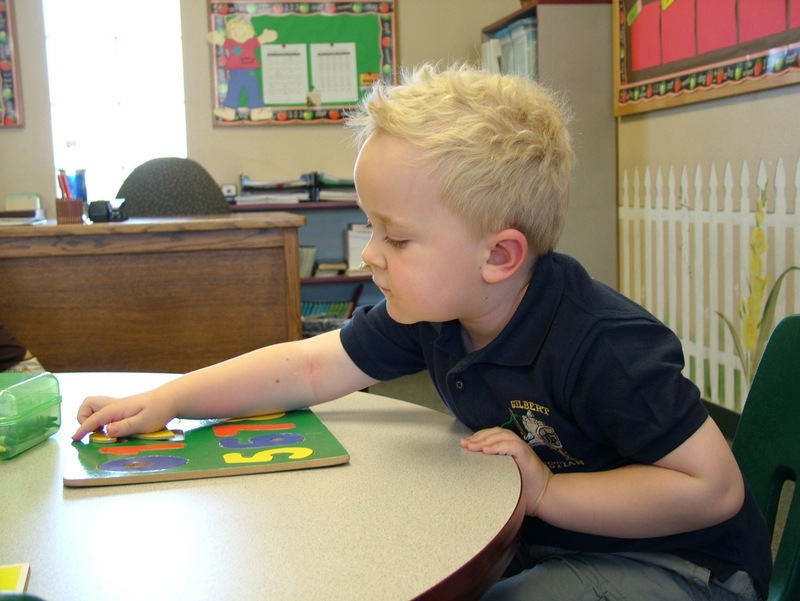 The only notable change for us here is that Julian has started Pre-K! That's right - our little man is now old enough for Pre-school. How did this happen - where has the time gone?! We count ourselves blessed every time we look at our little guy, and continue to thank God for his health and overall growth and progress. A big part of our Make-A-Wish trip last week had to do with where we actually stayed. Many thanks to the staff and volunteers at Give Kids the World, an incredible themed village of houses, restaurants and amenities whose sole purpose is to provide lodging for families like ours. They provided us with a wonderful place to rest with our group when we weren't running around the theme parks. You can visit them here. 07.01.2009 - Make A Wish! 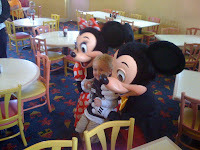 We arrived home last night from an incredible week at Disneyworld in Florida with the Arizona Make-A-Wish Foundation. It was amazing! We had the opportunity to meet several other wonderful Make-A-Wish families from all over the country, each facing their own unique set of challenges. We spent a week exhausting ourselves at Walt Disney World, an incredible experience all on its own. And we got to meet and spend time with our trip hosts, Kurt and Brenda Warner, along with their children. Kurt Warner is the quarterback for the Arizon Cardinals. He and his wife Brenda have a beautiful family. Kurt's foundation, First Things First, sponsored this trip. You can learn more about Kurt's foundation here. It was a fantastic week, and we had a great time! Thanks to everyone at Make-A-Wish and First Things First for making it happen - this really was a once-in-a-lifetime trip. 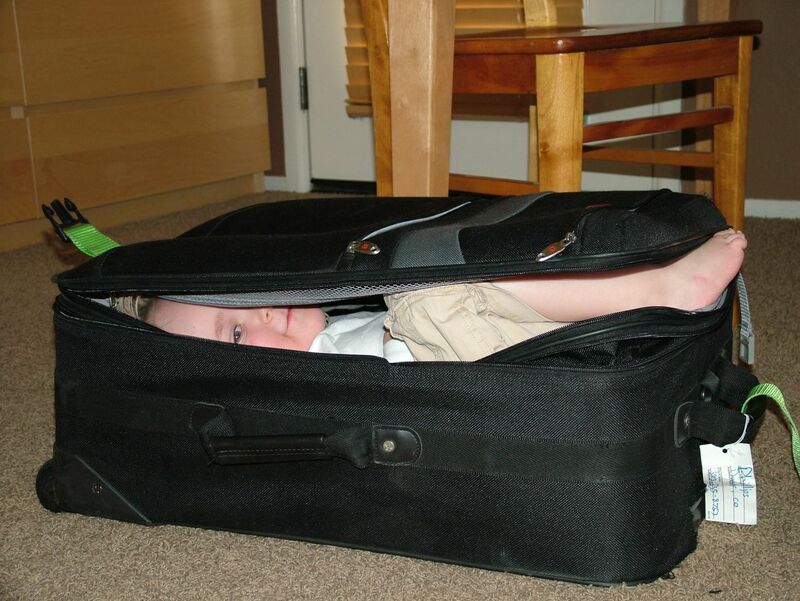 As you can see, Julian can't wait to leave for Disneyworld on his Make-A-Wish trip. I hauled the luggage to start packing, and he immediately "pitched in." He's super-excited! The Make-A-Wish arrives at 7:00 tomorrow morning. It should be a great trip. It's been two weeks since the biopsy, and Julian is doing great! In fact, today we can finally remove any behavioral restrictions, which is a relief, because it's darn near impossible to keep someone with this much energy from jumping up and down and running around. Julian has been a good sport though, so we rewarded him with a dip in the pool outside. We had a ball, as you can tall from the look on his face. We also changed the NG tube today, which Julian was not very happy about. However, it does mean we were able to get a few pics of him sans tube, which is always nice. It's remarkable how quickly he's growing. If you go back and look at pictures taken around the time of the transplant, he's really quite small. But Julian went from 25 lb. to 45 lb. in the span of 12 months. He's much taller as well. He used to be considerably smaller than other kids his own age; now he's as big or bigger. Fulfilling his genetic potential, as it were - I think that's how the docs in Palo Alto put it. Grow Julian Grow. Check out the additional pics in the photo album. Have a good night, and thanks for checking in. 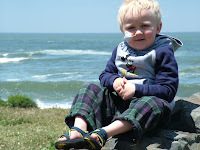 Here's a little video we shot last week in Half Moon Bay, when we were in CA for Julian's biopsy. It's been a good, but long, trip, and it'll be good to sleep in our own beds again tonight. 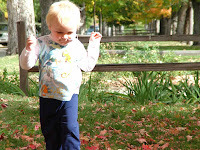 Julian is well, and you can read from previous posts that the biopsy results were good. We're thrilled that he's doing so well. And not it's time for bed. We went to Half Moon Bay this a.m. to revisit some of our old stomping grounds. What a beautiful day. No actual beach time, but it was great to see the sights and listen to the waves. 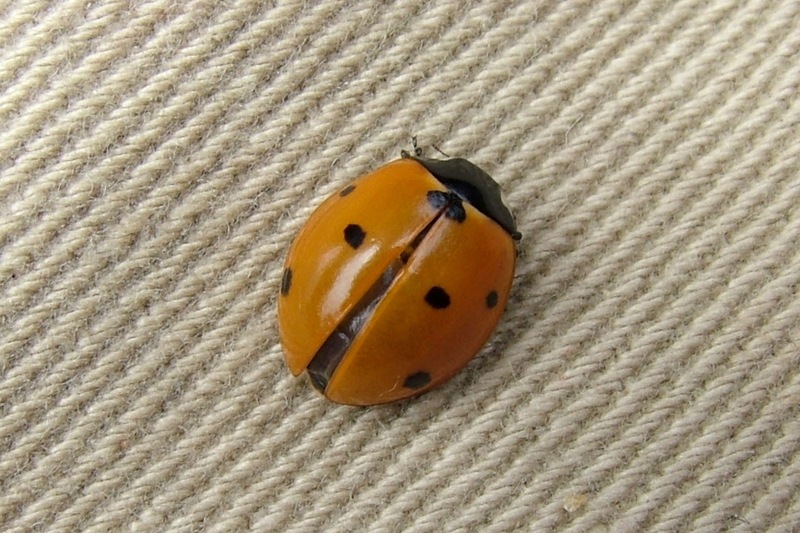 We found a picnic table at the marina where we ate our lunch, and Julian found a ladybug. We played with it for half an hour. It was still alive when we left. Then we headed back to LPCH to review biopsy results with the docs. Good news: No rejection, no medicine toxicity. One concern they will study further has to do with what looked like some kind of reflux, but we're told a) it's really common with this kind of biopsy, and b) it's unlikely any actual reflux is taking place, due to Julian's unique urological physiology. So, they're not worried, but will look into it further. Tomorrow, we head back to LA, where we'll spend a day with friends. Then Sunday, we'll drive back to Phoenix - home sweet home. 05.20.2009 - And We're Back! Julian woke up this morning his sunny, singing self. 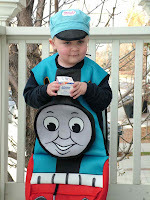 Right now he's playing with his Thomas Train engines and his new Troublesome Trucks. He's been saving for them, but we decided to buy them for him yesterday for being such a good sport throughout the day. The hard part now is going to be keeping him from jumping and running around. For TWO weeks. Seriously. One thing I didn't mention in yesterday's post had to do with the impression Julian seems to make on people. Repeatedly. When we showed up at the Day Hospital (the short-stay unit within the Children's Hospital), all 4 of the nurses on duty remember him from his previous visits (biopsies and infusions). The last time he saw any of them was in November. And when I had to go down to Admissions to pick up a new parking pass (bear in mind, Julian was NOT with me at this point), the woman asked "patient name?" I replied "Phillips." She asked "Julian?" When I confirmed, she went all ga-ga, asked how he was doing, asked for the update, etc. I'm always struck by the impression Julian seems to make on other people. He's so personable - and so cute - people remember their encounters with him for months - years even. It's funny, because at the same time, I can tell that I've not made the same impression on the same people. And I wonder if God has something special in mind for our little man. In the mean time, we'll do our best to take care of him, and enjoy the time we have together. We reported to LPCH this morning at 7:30 for Julian's biopsy, which was to take place at 1:00 p.m. At 3:00 p.m. they finally took Julian into the O.R. for the procedure. Around 4:00, Dr. Alexander came out to confirm that the biopsy had run smoothly - no bleeding, no fistulas, no knicked bowel - just a clean tissue sample. Julian had no problem coming out of anesthetic - unlike previous procedures, when it took hours (literally) for him to be able to breath normally on room air (i.e. without oxygen). What a relief! We spent the rest of the day in the Day Hospital, where we watched Wall-E and Kung Fu Panda at least twice each, until we satisfied the doctors' orders that Julian lay still for 8 hours following the procedure. We left around 11:00. We're back at the Donald House now. Julian is asleep. All is well with the world. We'll get preliminary results back on Thursday afternoon. After that, we should be set to begin the journey home. Thanks for tuning in. Please check back to see how we're doing. Cheryl Humble, Julian’s kidney donor, arrived on Sunday morning for her annual check-up. We went for a walk around the mall across the road, where there happens to be a display of play-houses that have been designed, built and donated by local architects. The houses are being raffled off for charity, but until then, they’re on display. We had a great time walking around, exploring the mini-homes. After that, it was time for a nap and dinner. A good day. This morning, we went for Julian’s pre-biopsy check-up, and Cheryl went for her annual. Julian and Cheryl are both doing very well. A couple tweaks to Julian’s med regimen, an adjustment to his daily fluid intake, and overall reduction in the number of times he has to go for labs. All routine. The docs are thrilled with his progress, and so are we. 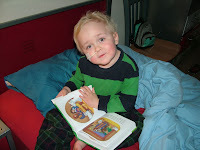 Tomorrow, we check in for Julian’s biopsy at 8:00 a.m. Please pray that all goes well, as there are several real risks to this kind of procedure, including bleeding, blood clots, and general infection. We content ourselves in the knowledge that these doctors do this kind of thing all the time, and that God will be with them and Julian in the operating room. Stacy drove Cheryl to the airport this afternoon. We should get preliminary results back on Thursday, and if all goes to plan, we could be headed home as early as Friday morning. Julian had an ultrasound this a.m., followed by an appointment with Dr. Kennedy, his Urologist. Our concerns for Julian re: all things urological were that if we were to proceed with surgical intervention to restore "normal" urological function, that it may in fact have a negative impact on the new kidney. We learned today that we're in no hurry to make any changes physiologically, that the only real impetus to pursue anything further would have to do with Julian's social consciousness connected to his own continence. I.e. he'll have to wear some manner of diaper from now until whenever we collectively decide to pursue some other course; now we know that we can wait for him to tell us when we should start looking seriously at that option. Does that make any sense??? Anyway, Dr. Kennedy relayed something once told to him by one of his profs. "No one dies from incontinence; however, people do die from the stupid things doctors do to them unnecessarily." Enough said. On Sunday, Cheryl arrives for her one-year check up too, so we'll get to spend a couple days with her as well. That should be fun. As for us, we have the weekend off, so we're planning on relaxing and taking in some of our favorite haunts. Maybe even a trip into San Francisco. Things don't start up again for us until Monday morning. We arrived at Ronald McDonald House in Palo Alto at 5 p.m. today, got checked in and settled pretty quickly. It's been a long journey here, and even with the day at Disneyland yesterday (which although fun is hardly relaxing), we are glad to be here. We've already bumped into some familiar faces, from the folks here at RMH, to some of the shop keepers at the mall across the road, and even one of Julian's nurses from last year, who happened by while we were out for a walk. It was good to catch up. Palo Alto really feels like home away from home. Our first stop tomorrow is Radiology at 10 a.m. for an ultrasound. Then at noon, we meet with Dr. Kennedy to talk about the future of Julian's bladder and urinary track. 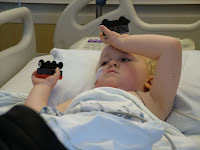 Next week, we meet with the kidney Docs, and on Tuesday, Julian goes under for the biopsy. Stay tuned - we'll try to keep things up to date. We're on the road, on our way to Palo Alto for Julian's biopsy. We're spending tonight and tomorrow in LA at our friends' place. We just heard from Ronald McDonald House in Palo Alto this afternoon - we've been accepted! That's a huge relief, as it's significantly less expensive than a low-budget hotel where we'd end up otherwise. There's also something comforting about our familiarity with the place. It feels like home away from home. We'll check in on Thursday afternoon. First appointments are on Friday. Right now it's time for bed. Happy Mother's Day everyone! Especially all you mothers. We're two days away from leaving for Palo Alto for Julian's 12-month follow-up. Hard to believe it's been a year already! We'll be driving from Phoenix to LA on Tuesday, Disneyland on Wednesday, and driving again from LA to Palo Alto on Thursday. Might as well have some fun while we're on the road. We have appointments with Urology and Nephrology starting on Friday, then Julian's 12-month biopsy on Thursday May 19, 2009. That's the one I'm nervous about: it's not a lengthy procedure, but it does require anesthetic, and the recovery makes it an all day affair. Not much fun for Julian. Not sure when we'll be back yet. My hope is that as soon as he's recovered, we can pack up and head home. It'll depend on the preliminary results of the biopsy (i.e. whether they need to do it again or not). Please pray that all goes well, and we can make the trip short and sweet. Thanks for checking in everyone! We'll try and post new material as the trip progresses. Greetings all! It's been a busy month, but a good one! I (David) am here in AZ full time - a huge blessing - we're all moved into the new house here in Gilbert, and Julian is doing well. No complaints. Well, I'm unemployed, so that could stand to change, but other than that, no complaints. I'm happy to be finished with what turned out to be exactly one year of long distance commuting. 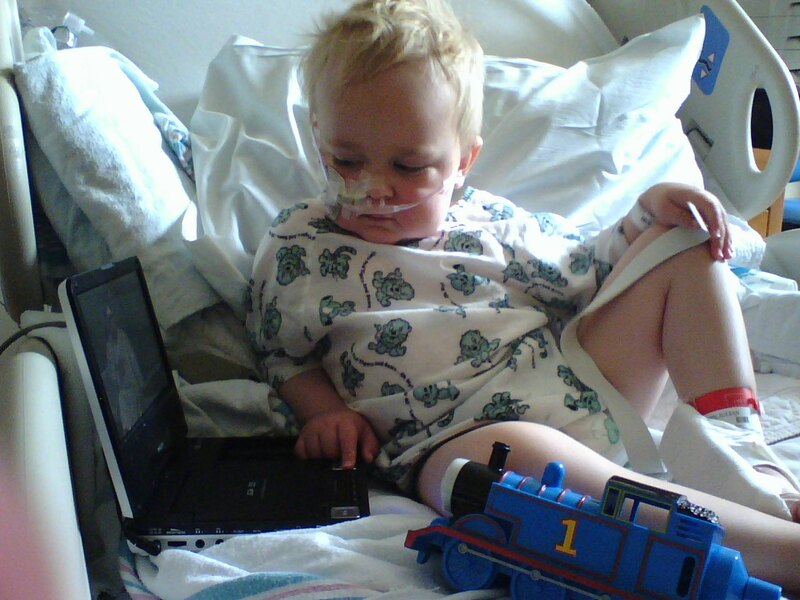 I have a whole new level of empathy for my son's current condition, as it relates to his N.G. tube. That's the feeding tube you always see taped to his face and going up his nose. Well, last weekend, when we had to change the tube out (we change nostrils every 4-6 weeks), Julian made it clear that he was none too happy with having to put it back up his nose. 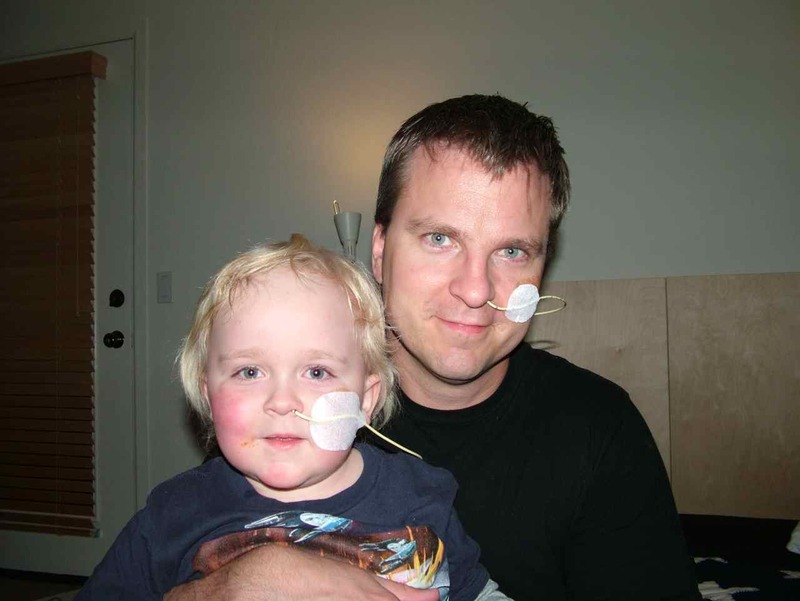 Once we were finished, we could tell he was frustrated when he took the stainless steel wire that comes in the tubes (keeps the yellow plastic tube rigid on the way in, then gets pulled once everything is in place) and aimed it at my nose. As near as we could tell, he was communicating "let's see how you like it!" - or something like that. So, I got to see how I'd like it. Julian watched as Stacy installed an N.G. tube on daddy. And that's no faux installation - there's about half a meter of yellow tube threaded through my head, back down my throat and into my stomach. And I can tell you first hand, it's miserable. There's a constant irritation in the nose/sinus, and there's that thing stuck in your throat that you can never quite swallow. How annoying! All things considered, I'd say he's been a remarkably good sport about the whole thing this past year. We hope he doesn't have to keep it much longer. In other news, we're coming up on one year since Julian's transplant. That means we'll be heading back to Palo Alto next month for his 12 month biopsy. Please pray that this is a productive trip, and that Julian is kept safe and healthy through all of it. The biopsy means he'll be under anesthetic, and although the the procedure is "routine" (Ha! Routine for who?!) there is some risk of infection. 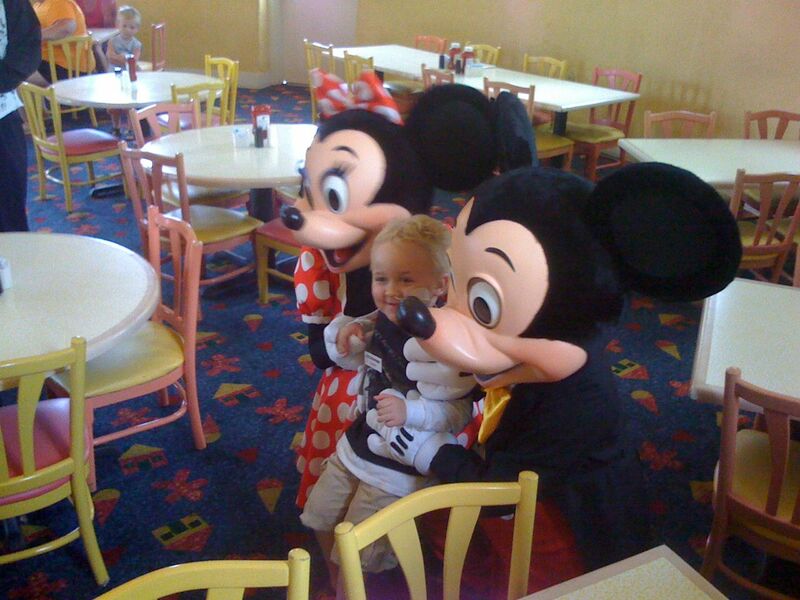 Please check out the Photo Album for a couple new pics of Julian: there a couple of him and his current crush (from a recent trip to Disneyland), as well as one of him in his friend's superhero costume. Good fun. 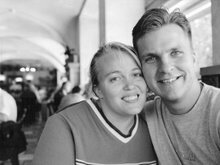 It has been awhile since we have updated Julian's COTA website so I thought I would let you know what is going on with him and with us as a family. No news is usually good news, and that is the case now. Julian is doing wonderfully. 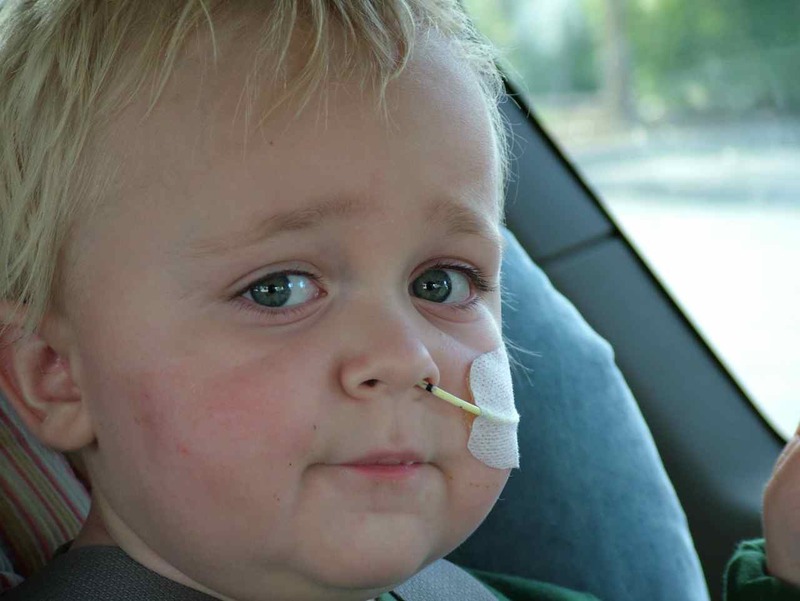 He has clinic visits once a month with Dr. Joseph of the Phoenix Children's Hospital, and he has labs twice a month. What a departure from the lab/clinic regimen of months past! We have entered into what I hope will be the norm for many many years, with Julian's kidney function being "normal." Praise God! As far as our situation in life, we are entering into a period where we are putting more and more reliance on the Lord for our daily needs, and looking to Him to provide (just when you thought you WERE relying on Him for most things, you are reminded by circumstances that there are many other areas where you COULD be relying on Him!). Dave's last day at work in Longmont Colorado, where he has been commuting to now for exactly one year, is on Thursday of this week. On Friday he will drive our other car here to Arizona, where we will most likely try to sell it and settle in to having one vehicle. We are excited to live in those challenges that the Lord has provided, relying on Him to make wise decisions on a day to day basis regarding everything He has entrusted into our care. We're happy to be settling down at last into new house in Gilbert, AZ (see previous post). This will, hopefully, be our "final" address for many many years. This last year we have moved 4 times....or more! I have lost track, actually. I am looking forward to more stability and constancy in every area, and...didn't thing I would ever crave it.....I crave ROUTINE. We continue to be thankful and grateful for everyone who has stood by us through this time, and want to say that there is definitely still a need, if you feel led to contribute in any way, to Julian's ongoing kidney needs. His medications alone approach about $500 per month in co-pays. You can make a donation through this website and it is tax-deductible. Just a quick note to share a new pic of Julian. 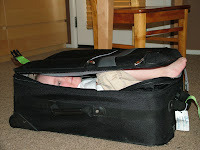 Looks like he's ready to go! It was a ton of work (and we're not quite finished yet - still some large heavy objects to move next weekend), and we're thankful for the help we received from friends and family to get us this far. Julian had a ball - the highlight for him was the U-Haul truck, which he referred to as the garbage truck (?). He loved walking up and down the ramp unassisted ("all by you-self" as he says), sitting on the "bench" in that elevated space above the cab, and doing the moving day dance - a kind of exuberant stamp-dancing thing he does - in the back of the truck. At the end of the day, he was dismayed when we had to give the truck back to the people we rented it from, but was assured when we told him we'd do it all again next weekend. In a similar vein, as we settle into our new life as a family in Gilbert, we're finding it increasingly difficult to weather my commuting schedule. Although we live in Gilbert now, I still work in Longmont, Colorado, and fly back and forth each weekend. It's not untenable - we've been doing this for nearly a year now - but I feel like I'm missing too much of my son's childhood. My number one goal right now is to live with my family full time. To that end, I'm in the process of looking for work in the Phoenix area. The economy being what it is, looking for work seems a daunting task. But we've seen God deliver miracles when greater stakes than these were on the line, so we're confident that he'll provide for this need as well. Please pray with usto this end. I realize it's been way too long since our last update, but suffice it to say that no news is good news. Julian is strong and healthy, and his Docs in Phoenix and Palo Alto are pleased with his progress. Needless to say, we as parents are thrilled with how things have gone over the past year - and what a year it's been! It's hard to believe that 12 months ago we had just returned from our first coordination visit to Palo Alto to see if Julian would even be a viable candidate for Stanford's steriod-free protocol. He weighed around 25 lbs. (and was not growing) and his combined kidney clearance was below 10%. Today? He's over 40 lbs and his new kidney is doing what a kidney is supposed to be doing. What a miracle! We'll try to get some fresh pics and/or videos up on the site so you smile along with us as he grows up in front of our eyes. Greetings to everyone on this Christmas Day. Merry Christmas! I wanted to update you all that has transpired over the last several weeks regarding our situation. In light of that development, Dave is looking to find a job in Arizona and will relocate as soon as he has secured one. Meanwhile he commutes here to Gilbert every Thursday, returning to Colorado every Sunday. When I purchased the tickets for him, they were only booking up until the first weekend in March, so I am curious if we will need to purchase more tickets for him or if he will be here permanently by then? Secondly, we received a letter from Medicare that I just opened today that backdates Julian's benefits to April of 08. Why is this important? Backdating the benefits means that Medicare (instead of Julian's insurance policy) will pay for Julian's transplant, which will "spare" his Blue Cross policy about $350,000 in already paid benefits. Since his "cap" on benefits is $2 Million and he's up to $800,000 already, this will mean that $350K is "backed out" of his benefits-already-paid and we will be able to utilize it later for him, if necessary. Since we are keeping the policy, this is an important piece. In my wildest dreams I did not think we would have answers to these things by Christmas. But here it is, Christmas Day, and we have answers. Our year of extreme uncertainty (procedures and outcomes for Julian, a donor for his Kidney - thanks again and again Cheryl! - our living situation, the future) is coming to a close. It was a year that demonstrated life's uncertainty, and God's response to that uncertainty, which has always been "Be patient. Do your part. Wait for My answer, wait for My provision. I have the answer coming up the other side of that mountain you are climbing." Was "our part" easy? No. In a word, No. But it was still our part. We had to be diligent. We researched steroid-free vs steroid transplants. We applied for Medicare. We asked them to re-open the file when we got conflicting information from them as to when his benefits were actually supposed to start. We did the legwork. God doesn't bless laziness, sometimes I wish He would but He does not. So we did our part. Dave and I have felt like Abraham must have felt climbing that mountain with his son. Trusting that God would provide, but not knowing how, or when. Not knowing, for sure, whether he would be making the journey back down the mountain with his son at his side. All the while Abraham was climbing the one side of the mountain, the ram that God was going to provide, the "answer" to Abraham's quandry, so to speak, was trudging up the other side of the mountain. From God's perspective He had already provided the moment Abraham took his first step up the trail. Therein lies the struggle, struggling to rest in the knowledge of God's provision, while not being able to see it with one's own eyes at the moment one wants to see it. Did I "rest" in that knowledge? I can say practically I did, there was nothing else I could do. But emotionally I struggled. I was anxious more times than I like to admit. My mind trying to hit it from every angle, and coming up short, and coming up frustrated as far as what the answer would be, and when we would know it. But the answer is there when you NEED to see it, not necessarily when you WANT to see it. That is my Christmas lesson. And my New Year's Hope is that this year's terrain will be a little less steep. Trusting in God all the while, I sense that we have begun the journey back DOWN the mountain again. And our son is at our side. Praise Him. And to all of you, Merry MERRY Christmas, and Happy New Year. By now, some of you are receiving your hard copy of our Christmas Newsletter, which was written a few weeks ago. Below is an abridged version of the hard copy. Hello everybody, and Happy Holidays! Thanks for taking the time to read the very-nearly-annual Phillips Family Newsletter. This newsletter marks the first time we’ve actually included those who have contributed monetarily to Julian’s account at the Children’s Organ Transplant Association (www.cota.org) in the distribution, and as we were entering names and addresses, we were struck by how many of you we’ve never actually met. Add to that the hundreds of people who have been praying for Julian for the past four years, and the list would be staggering. We are truly blessed and humbled. It’s Thanksgiving weekend here in the U.S., and we’re thankful for the support we’ve received from every one of you. 2008 has indeed been quite a year - especially for Julian. A year ago at this time, he underwent surgery to place a catheter for peritoneal dialysis at Denver Children’s Hospital. Since then, we trained for P.D., the catheter failed, and he underwent surgery (#2) to remove it in January. We then discovered the steroid-free kidney transplant protocol at Lucile Packard Children’s Hospital at Stanford University, were accepted into that program, and in April, Stacy & Julian moved into the Ronald MacDonald House in Palo Alto. 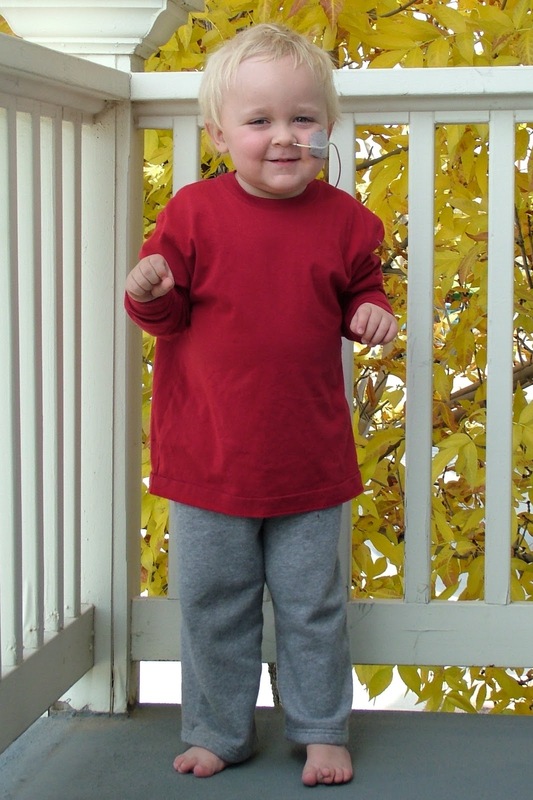 Julian underwent surgery (#3) to install a hemo-dialysis port, and was on hemo-dialysis for roughly six weeks. Cheryl Humble, a friend of ours from Stacy’s tenure at Ravencrest Chalet, graciously offered to be a live donor for Julian, and on May 20th, Cheryl and Julian underwent surgery (#4 for Julian) to transplant one of Cheryl’s live kidneys into Julian. What a miracle! Thank you forever, Cheryl. A few weeks after that, he underwent surgery (#5) to remove the hemo-dialysis port. Julian had a great summer, and we enjoyed our season at the coast. Then in September, Julian underwent surgery (#6) to have his 3 month biopsy. 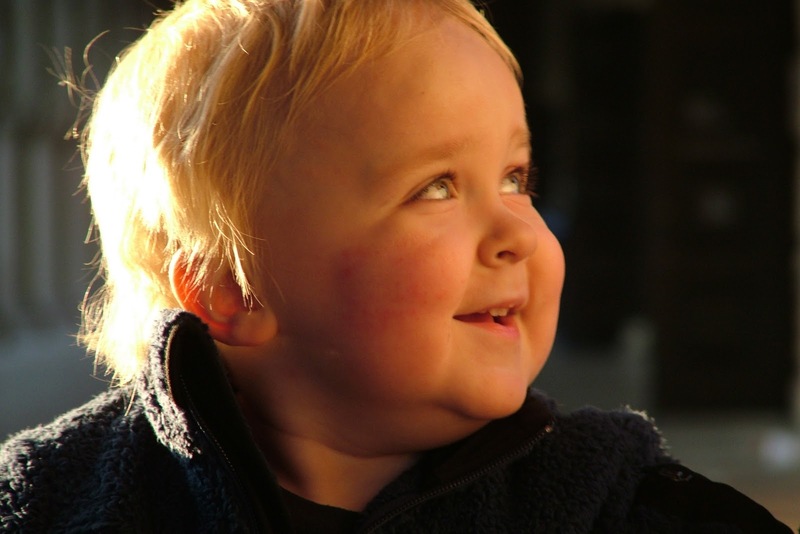 Then a week later, he had surgery again (#7) to have his tonsils removed, after it became clear that he may be having Obstructive Sleep Apnea, a condition not uncommon for transplant patients once they start to “catch up” on their physical growth (Julian gained over ten lbs. in the ten weeks following the transplant). Seven surgeries in less than a year! And he’s still one of the sweetest little people we’ve ever met. Not that we’re biassed. In late September, once Julian’s observation period was complete, he and Stacy moved back to Colorado. In November, they relocated to Gilbert, AZ, where Julian can receive the care he needs in Phoenix over the winter. David continues to live and work in Longmont, and flies to Arizona to visit when he can. Certainly not what we had planned, but we do what we must. Hopefully this will be a short-term arrangement. Through it all, we recognize God’s hand of healing and guidance, albeit not always beforehand. There have been times when it’s been just plain scary. But at present, Julian is remarkably stable, and the Docs in Palo Alto consider his case “boring” - which means everything is going exactly according to plan. 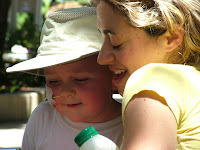 It seems that Cheryl’s kidney is perfect for Julian, and continues to exceed our hopes and dreams for this transplant. Of course we as parents are thrilled with Julian’s progress, and have every hope that it will continue for many, many years. 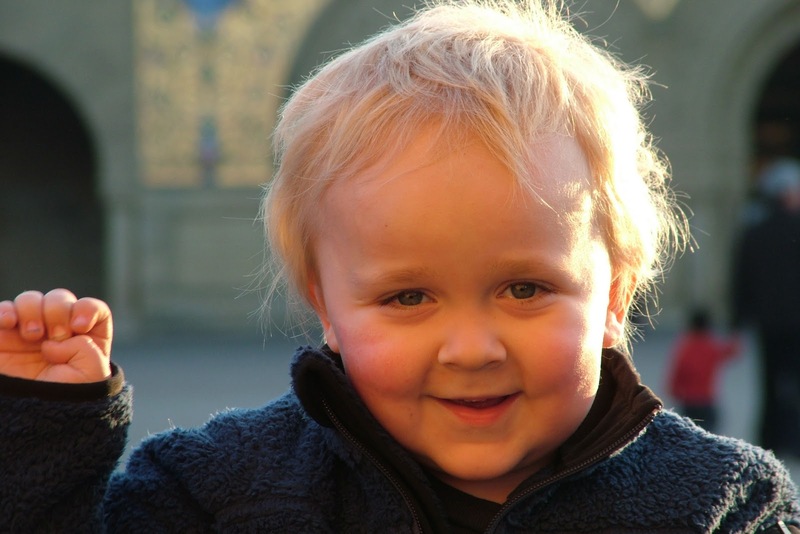 One of the reasons for this newsletter is to remind you that it’s always possible to make a financial donation to the Children’s Organ Transplant Association on Julian’s behalf. Donations are tax deductible for U.S. residents, and help to offset the ongoing costs associated with Julian’s transplant, which include monthly prescription co-pays, which can exceed $300.00 per month. Add to that regular labs and doctor’s visits here in Arizona, periodic visits to Palo Alto for biopsies and protocol clinic visits - it adds up fast, even when things are going well. Please click the “donate” tab at the top of the page. And “thanks” in advance from all of us. Please stay up to date with us right here at Julian's COTA Journal. If you're reading this online and would like to be added to the hard-copy mailing list, or you have an address change, please drop us a line and let us know. First thing this a.m. we flew from Phoenix to San Jose, and drove up to Palo Alto. We had a 2:00 clinic visit with the nephrology docs at Lucile Packard Children's, which was to be followed tomorrow by Julian's 6-month kidney biopsy. However, when the docs received the final lab results from last week's pre-biopsy labs, they discovered a bacterial colonization in his bladder. 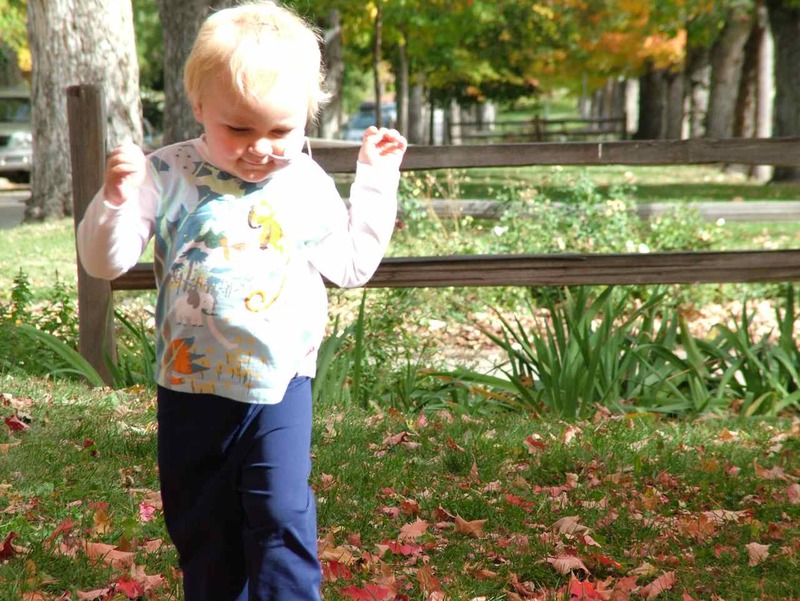 This is nothing new, as bacterial colonization is common for kids with vasecostomies. However, the colonization they discovered was of an unusually high concentration, and was accompanied by a white blood cell count that was outside the acceptable range (too high). As such, they're treating it as a urinary tract infection, and have prescribed an antibiotic to fight the colonization. They've also cancelled the biopsy. The consensus at this point is that the potential information they may garner from the biopsy is not worth the risk of putting Julian under and needling the kidney if there's even a possibility of infection from the bladder that could track up the ureter and infect the new organ. For our part, we're in full agreement. Julian is doing so well - his blood chemistry is very nearly perfect - that they don't think they would have made any major changes to his medication regimen anyway. So, we're thankful to be off the hook. Julian is going to have an ultrasound tomorrow morning in lieu of the biopsy, and in six months, we'll try for the 12 month biopsy. In the mean time, we're thankful that he doesn't have to be subjected to a minor surgery, and hopeful that the bladder infection will subside with treatment. Please pray with us to that end. So, we'll enjoy our time here in the Bay area, and fly home on Sunday. I (David) am sitting at the coffee shop in Gilbert, AZ, while Julian takes his nap. It's been a great Thanksgiving holiday weekend. I'm flying back to Colorado this evening. Then, on Wednesday night, I'm flying back here, so the three of us can fly to San Jose on Thursday morning for Julian's +/-6-month clinic visit. On Friday, he'll have his 6-month biopsy. Not looking forward to that, but hopefully things will go a little smoother than last time. The fact that his tonsils are out should help. Saturday we'll spend relaxing in Palo Alto, then Sunday I'll accompany Stacy and Julian back to Phoenix before hopping another flight back to Denver that evening. After all that, we can get back to "normal." We've also been working on the newsletter, which we hope to get in the mail sometime in the next week or two. Included in this year's distribution is everyone who has contributed monetarily to Julian's support through COTA. It's humbling to see all the names on the list (provided by COTA), and all we can do is say Thanks! Whether you've supported us through prayer or by contributing to Julian's fund, we couldn't have done it without you. Stay tuned toward the end of the week for biopsy updates. "This is the reason I bow my knees before the Father of our Lord Jesus, the Messiah, from whom every family in heaven and on earth receives its name. I pray that he would give you, accord¬ing to his glorious riches, strength in your inner being and power through his Spirit, and that the Messiah would make his home in your hearts through faith. Then, having been rooted and grounded in love, you will be able to understand, along with all the saints, what is wide, long, high, and deep— that is, you will know the love of the Messiah, which transcends knowledge, and will be filled with all the fullness of God. Now to the one who can do infinitely more than all we can ask or imagine according to the power that is working among us— to him be glory in the church and in the Messiah Jesus to all generations, forever and ever! Amen." Yes. God has given us more than all we can ask or imagine in his merciful dealings with our sunshine, our Julian. With it comes trials, most recently and most poignant being the current trial of us (Stacy and Julian) having to live apart from Dave for reasons of what is best medically for Julian at this time. Being unable to adequately coordinate his care in Colorado, for reasons I will not go into here, Julian and I have relocated for the winter to Gilbert, Arizona in order that he can be followed by a Pediatric Nephrologist in this, the most critical year after transplant. Dave continues to live and work in Longmont, Colorado, and will continue to do so for the foreseeable future which is both necessary, a blessing (economically), and a hardship - we miss him. Currently he is able to visit us every weekend, from Thursday night through Sunday night. Dave and I felt, from our courtship, through our vows, through our early years as a married couple that we believed that God had orchestrated a long-distance relationship between us entirely through letters and the phone because He would call upon us one day to be separated physically for whatever reason, for whatever length of time HE determined. Well, I believe we have our specifics on that generality. This is the time. This is the "someday". And I'll admit. It's hard. But I am calling on the Lord for HIS strength at this time to bear this burden. To get through this time. Because He said he'd give it. And who am I to question His wisdom? That is the heart of the matter. The details of the matter are that Julian is doing phenomenally well, and I get to see my husband this weekend. We pick him up from the airport around midnight. For the nuts and bolts update, Julian has his bi-monthly labs tomorrow at Phoenix Chidren's Hospital, has his pre-biopsy labs the Monday after Thanksgiving, and then we fly to Palo Alto for his 6-month biopsy on December 5th. Please pray for no infection, no excessive bleeding, and no perforation of his bowel which happened last time. Pray there would be no signs of rejection, and that Julians kidney lasts 40+ years. Thank you for your prayers. After that, we have a visit with his Pediatric Nephrologist here in Phoenix, who will be working closely with Palo Alto in administering care for Julian. We will be having clinic with him here in Phoenix (they actually have an East Valley Campus Extension a few miles from us!) once a month, and will travel to Palo Alto once every 3 months for clinic there. Then there is the 1 year biopsy, and the two year biopsy. At our 1 year biopsy and clinic we will be meeting with his Urologist at Lucile Packard in order to discuss related issues with his bladder and ultimately make some decisions on when we will pursue operations to improve his current system. Stacy & Julian left this morning for Palo Alto so Julian could receive his final Zenapax infusion. He'll receive that tomorrow after his quarterly visit with the docs in clinic. On Friday, they'll to Phoenix (Gilbert) where they'll stay for the winter. I'm driving down to meet them this weekend, then fly back to Colorado on Monday. After that, I'll resume my commuting schedule between Denver & Phoenix. Julian is doing well. He's just now at the tail end of his head cold, and it's reassuring to know that his body is capable of recovering from a cold while on immune suppression. 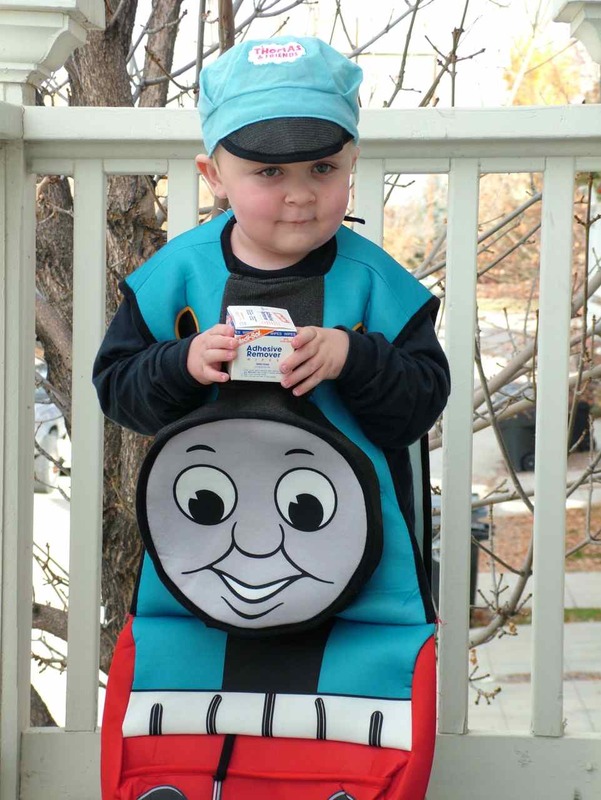 The picture is of Julian in his Thomas the Tank Engine costume. There's also a new video on YouTube of Julian as he addresses the very serious issue of Thomas's nasal gastric (n.g.) feeding tube. Enjoy. We are flying to California on Wednesday to get the infusion on Thursday. Julian is doing much better with his cold, it has nearly run it's course so I feel more confident flying with him, only I will be doing it without Dave so you can pray for me there! We will spend 2 nights, coming back on Friday. We've already started to make plans for Julian and I (Stacy) to spend the winter months in Phoenix, and as such have started to work with Phoenix Children's in anticipation of the change. Phoenix Children's Hospital has already contacted the Palo Alto team requesting records, and had advised they would be assigning Julian a Nephrologist in the next few days. Wow. What a relief. Please continue to pray for Julian's health - his cold is not quite over yet. However, it is reassuring to know that, even on immune suppression, he can recover from a cold pretty much on his own. We are back in Colorado, and were scheduled to fly back to California yesterday for an IV infusion, Julian's last IV infusion, of one of his anti-rejection drugs. However, Julian got sick on Monday with a bad cold, and Dave and I were concerned about transporting him all over the country through airports and plane-rides to get him his infusion, when it could be done here in Colorado at Denver Children's Hospital. Tuesday night I was assured by the Children's Hospital physician "One-Call" hotline that if I called the patient advice line in the morning, Julian would get a Doctor who would be able to sign off on the orders from Palo Alto, and get the infusion. The Infusion Room at Denver HAS the drug in inventory, and they are more than willing to schedule him for the infusion but need an "in-house" Doctor to sign off on the orders. The Kidney Center at Denver has categorically refused to have anything to do with Julian, including writing the orders for this anti-rejection drug that Julian requires THIS WEEK, because we have not "transferred his care" back to them. Nor do we have any plans to. They don't do the steroid-free protocol, and won't take orders from Palo Alto. However, they are not even treating him as a visiting person who would be under the care of a "home" nephrologist and in need of services, which they need to do whether he is under their care or not. I have been in contact with the Physician One-Call, the Patient Advice Line, the General Pediatric Clinic, the Specialties Care Clinic, and am still imploring the Kidney Center via e-mail as to why they cannot write orders on advice of the Palo Alto Nephrologists? They are all within the Children's Hospital Network...I just don't understand. I have left a message for his case manager at Blue Cross Blue Shield, and am getting ready to call the CEO if I can't get this done. Pray pray pray! The only inroad I presently have is that Dr. Elias, of the Denver Children's Hospital Specialty Care Clinic has agreed to speak with Julian's Nephrologist in Palo Alto and CONSIDER being Julian's contact person at Denver Children's. Please pray especially that Dr. Elias would consent and give this treatment. Stacy has been pursuing Julian's care on this one particular issue tirelessly ALL WEEK. She's worn out, but will not stop until it is resolved. Anyone who knows Stacy can attest to her tenacity when it comes to the pursuit of something that matters to her - and few things matter more than Julian, to either of us. It is immensely frustrating watching doors close as Stacy pursues lead after lead. At the end of the day, if this infusion can't be administered here in Colorado, we're willing to put Stacy and Julian on a plane next week (once Julian has recovered from his present ailment) in order to get what is essentially a 15-minute intravenous treatment. The notion that this treatment cannot be administered here is preposterous - how would someone traveling to Colorado from out-of-state have this taken care of?! There has to be a way - yet Denver Children's (especially the nephrology clinic) seems resolute in its denial of this service. Please pray with us that this can be resolved, one way or the other. Here it is, October 26th, and it's been two weeks since our last update. Julian is doing fantastically well. He continues to get stronger, and is actually "running" now. We still do weekly labs and weekly visits with his Pediatrician, with a visit to Palo Alto once a month, but hopefully we will be able to pare that to twice a month with his Pediatrician and every 3 months with Palo Alto. Julian remains the cheerful, bright, sunny boy he has always been. We were able to take our annual "Fall Pictures" this year, only this time the trees were SO beautiful on our WAY up to Gold Hill that we skipped Gold Hill all together and took all of our pictures instead on Mapleton Street in Boulder (click "photo album" at the top of the page to see more). We have been able to see a few friends, much fewer than I'd like to have seen, but we are trying to make the rounds. We will head to Gilbert to spend time with Family at Thanksgiving, and we plan to spend the coldest months of the winter there. My sister Kim is due with their fourth child in February, so it will be nice to be able to add some support for her, and Julian loves babies. As far as his treatment regimen goes we leave on Wednesday the 30th for Palo Alto for a clinic visit with his Nephrologist, as well as a follow-up with his Ear/Nose/Throat doc regarding his tonsellectomy. He will also receive his last IV infusion of a drug called Xenapax. This is a hard-hitting immune-suppressant that works at the cellular level, inhibiting the cellular receptors to one of the illness-fighting white blood cell types. Thankfully, after this last infusion, his immune-suppression should be able to be toned down a little and we will be able to "rejoin activities" we have previously been told not to do, like take Julian to the store, to restaurants, etc. The prayers we would ask for at present would be for us to be able to fly roundtrip to San Jose from Denver without Julian catching anything, and of course in safety. 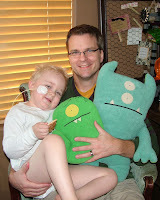 Dave and I have gotten our flu shots, but Julian is unable to receive any form of vaccination for a full year after transplant. I am always in awe of the power of prayer. Thanks again. Just a quick note to tell you that we are back in Colorado and Julian is doing well! We had our first appointment with his Pediatrician on Tuesday, which will be weekly for awhile. Then he had labs on Wednesday, which will also be weekly for awhile. Julian is happy we are all together again, and he seems to need constant reassurance about his Daddy's whereabouts. Several times during the day I'll hear "Hey, where's Daddy?" And I answer him "Daddy is coming home for lunch" or "Daddy will be home from work soon". It's nice living so close to Dave's work where we are able to have him come home for lunch. We still plan on spending the coldest parts of the winter this year in Gilbert, which would be Thanksgiving through mid-April. It will be good to get Julian out of the harsh cold during his first year post-transplant. Thanks again for all your support, both prayer support and otherwise. Without trying to pressure any of you, I wanted to mention that we do still have some transplant-related needs financially, both from our time in California, and recurring expenses such as medicine co-pays and recurring trips to Palo Alto to see his Nephrologist. If any of you have the inclination and the means to give a tax-deductible donation (dare I even ask in these economic times?) please click the Donate tab above. We'll post updates here on the COTA website as we resume a more settled lifestyle here in Colorado. Please check back from time to time for news and photos. What a wonderful, stressful, life-impacting 6 months this last 6 months have been. Here we are, getting ready to leave almost 6 months exactly from when we left on April 7th to come to Lucile Packard Children's Hospital. Julian is doing wonderfully. We want to thank all of you for lifting us up in prayer as you have. Your support, both prayer and financial, have been an immense blessing to us that we can't even begin to repay or recount. Thank you. Julian will have his last "weekly" clinic here at Lucile Packard next Thursday, and we will have their seal of approval to journey off into the world (more on our plans near the bottom). We will come back once a month until January, when we will then begin to come back once every 3 months. We have 3 biopsies left, one at 6 months one at 1 year and one at 2 years from the date of transplant. Julian's throat has healed nicely from having his tonsils out. He grew 2 cm in one week, and I suspect it was because prior to having his tonsils out he was only oxygenating in the low 80%'s for half the night. Not a great environment to grow and thrive, especially in the area of height. But once those tonsils were removed and he was able to be "fully oxygenated" all night long, he has just sprouted. We came to Lucile Packard with him wearing some 18-24 M clothing, and some 2T clothing. He is now, 6 months later, fully into 4T clothing both in length and girth. What an amazing testimony to whether he needed a kidney transplant or not. I'd say he did, and I'd say God provided the right kidney for the right kid. I want to send another heartfelt "Thank You" to Cheryl Humble, who is our hero. She and Julian will share the bond of "blood relationship" for life. What a precious gift she gave when she gave her kidney, and our nighttime prayers always include this very special lady. I also want to thank Mrs. T and Bonnie Thomas, who have kept in touch with me through this stressful time. Their calm, steadfast words were always an encouragement to me (Stacy). And to all our other friends and family who made sure we knew were "there" for us if we needed anything. Thank you. Thanks Kim, my sis, and Bob and Mary, my father and his new bride! Thank you COTA, who will continue to play an important role in our lives. Our fund was negative going into this month, and they allocated some funds from an anonymous giver to our account so we could cover some more of our expenses. Thank you anonymous giver. The wonderful thing about the COTA account is that Julian will be able to draw on it for his entire life, if we continue to raise funds. 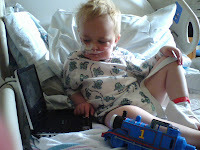 He can use the funds for transplant medication, and even, when the time comes, another transplant should one be needed. So, many people have asked what our plans are from here. Well, we continue to call Colorado our home, and have a place in Longmont that Dave has been living in solo for the last 6 months, commuting on weekends to see us here in Palo Alto. We will return there and spend time up until Thanksgiving, when Julian and I will go visit family for several months in Gilbert, Arizona. We will escape the cold Colorado winter for warmer climes while Dave commutes on weekends to come see us. Then in April or so it will be back to Colorado for Julian and I until the following winter. I think we are the youngest snowbirds in the history of Arizona/Colorado. We will see how that arrangement works for awhile. We must remain residents of Colorado because Julian's insurance is Colorado-based. If we ever decide to relocate to Arizona and leave Colorado, we will need to have an alternate insurance solution set in place, whether it be employer-based should Dave ever get a job in Arizona, or what not. In that Julian is a Transplant recipient there aren't many insurance alternatives for us and so we must make our decisions based on the best insurance/care we can get for him. So! If you were confused for awhile as to where we were actually going to live, I hope that clears it up! Our address in Longmont is: 1048 Katy Lane Unit #B, Longmont CO 80504. So you can update your Christmas Letter list to that address, as we are no longer on Apple Valley Rd. We leave here on October 3rd and will be back in Colorado on October 6th, stopping in L.A. to see friends and go to Disneyland, and swinging through Arizona to see family. We will continue to post updates on the COTA website, although they may be monthly (or for special prayer!) instead of weekly. Thanks again for standing with us through what has been THE most challenging and stressful times in our lives thus far. And we thank the Lord ultimately for never giving us more than we could handle at any given time, although He must know me better than I know myself (obviously) because I'm convinced He came close once or twice...hopefully His refining fire caused some of my dross to surface (just ask my hubby and he'll nod his head on that one) and hopefully He has skimmed it off. Hello all! Stacy here. Julian is healing well from his Tonsillectomy, and he had a follow-up ultrasound for his transplanted kidney today...Dr. Grimm said it "looks good". That is good enough for me! It looks like we will be leaving here on the 3rd of October to go back to Colorado. His after-care right now looks a little sketchy, the transplant nephrologists at Denver Children's have indicated verbally that their clinic isn't willing to see Julian on a clinic basis unless his care is transferred to Denver and we are unwilling to do that. I'm currently looking into the justifications for it and wondering why they can't all just work together on a collaborative basis with Palo Alto (Stanford) Doctors making the decisions and Denver seeing him once a month for his check-up exams to report back to Stanford. So we could use prayer there, since we are bound to Colorado for insurance purposes and Denver Children's have the only Pediatric Transplant Nephrologists in the state. Our pediatrician is happy to see Julian, but he doesn't have the expertise that the Denver team would have and I don't want anything to be missed. For now we will be flying to Stanford once a month until we can get it sorted. God has been so good to us during Julian's entire journey, and we have been his strongest advocates. I am sure I have rubbed people the wrong way in my tenacity to make sure Julian is well looked after, but my job isn't to have people like me: my job is to advocate for my son. But so far we have no complaints and we are winding up our time here in California. We look forward to getting back to some normalcy once we leave here. We will go see friends in L.A. and go to Disneyland on Saturday the 4th, which will be fun for all of us, especially Julian. Anyway thank you all for your continued interest in Julian's care and well-being. 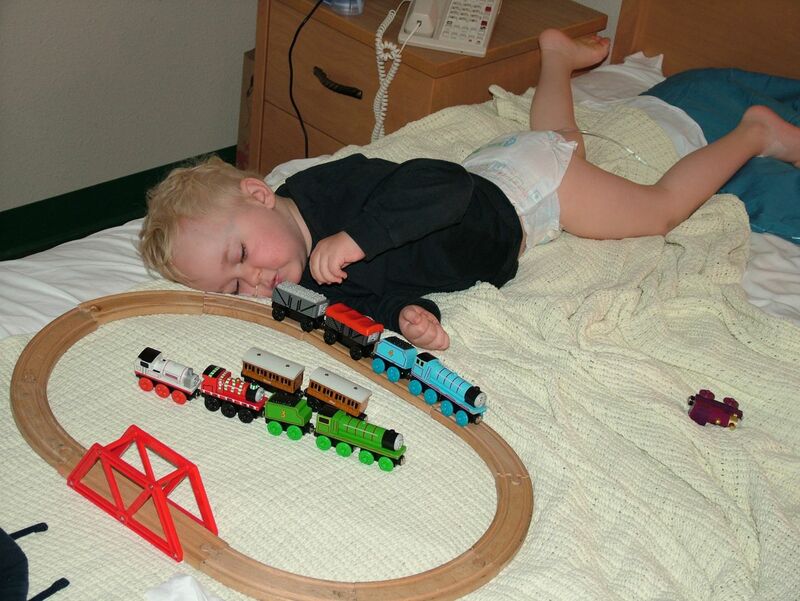 We are back at the Ronald McDonald House, and Julian is napping peacefully and "quietly"! No snoring, no obstructive apnea, no cessation of breathing! We are thanking God for the miracle of modern medicine and the healing touch He brings as well! We are very glad the docs decided to do the surgery after just looking at Julian's tonsils. Usually there is a sleep study required, then an analysis, etc. But the Ear/Nose/Throat Doctor bypassed all of that and expedited (and I mean EXPIDITED) Julian's surgery...they admitted him to the hospital the SAME DAY as the evaluation and did the surgery the next day. It was interesting to see Julian's oxygenation saturation numbers the night before the surgery and then to see them last night, 2 night after the surgery. The night before the surgery, he was dipping into the low 80's during the second half of the night, on a regular basis. He was hard to arouse during these times, and it is obvious now by looking at the monitors that he was not getting enough oxygen during these portions of sleep. However, last night he stayed in the mid-high 90%'s all night long. I am so glad we got this resolved. If any parents out there of young children notice that they snore alot during the night, and seem sleepy during the day, or gag themselves awake occasionally throughout the night, I would recommend getting sleep study to see if they have Obstructive Sleep Apnea. Over time it can actually damage their brain and/or heart. Well, thanks again for being a part of our prayer team! It appears now that we will be staying through October 3rd. Julian has his second-to-last Xenopax (Decluzalab) IV infusion on the 2nd which we cannot get at Denver Children's Hospital unless we change his Pediatrician from Dr. Beesley in Estes Park to someone we don't know at the day clinic at Denver Children's.....which we're not about to do.....so we need to stay here in California and then come back again on October 30th for his last one. p.s. Stacy called me at SJC to report that Julian woke up from his nap HAPPY. For several weeks now, he's been waking up grumpy (this is starting to sound like Snow White...) due to the fact that he could never really get any deep rest while sleeping, such was his obstructive apnea. I think we'll all sleep better now. 09.14.2008 - And We're Out! We're out! Back at the Ronald McDonald House, and Julian is back to his sunny self. We can tell his throat is still a little tender, as he's speaking only when necessary. However, he's not indicating that he's in any serious pain. I suspect he's a little tired though, even if he won't admit it, so we'll be putting him down for a nap in the next few minutes. Stacy is off to Safeway to procure provisions and fill prescriptions for the week. She'll be back by 4ish, and I'll head off to catch the train to the airport. The timing could scarcely have been better this weekend, considering everything that took place. So, we'll be here for three more weeks. We have follow-up appointments with ENT, and regular clinics and labs with Nephrology each week until our departure. The plan, assuming Julian remains in good health until we leave, is to leave Palo Alto on the first weekend of October. Of course we'll be back periodically for follow-up care, but we won't be living here any longer. It's been strenuous, all this flying back and forth. But I'll miss it all the same. We've been in the bay area for long enough now that it's started to feel a little like home. Thanks for keeping tabs on us all this time. Stay tuned. Julian is feeling much better this morning. He had a good night sleep, only coughed himself awake a couple of times early on. From midnight on, however, he slept pretty soundly. Right now the residents are working on his discharge papers while we pass the time watching movies. Julian is laughing and singing, so I think he's returning to his normal sunny self. We're hoping to be out of the hospital in the next couple of hours. Just in time for my flight back to Colorado. What a weekend! 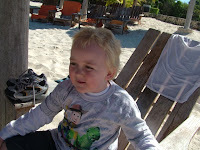 The ENT docs want to see Julian again in a couple of weeks, so it looks like we'll be here until the end of September. The end is in sight. Please pray that all goes well and that Julian continues to heal. Julian is doing better. When I left he and Stacy in the room last night (I needed some solid sleep at the Donald House), Julian was still on serious O2 support, and he hadn't really ever "come back" post-anesthetic. This morning when I arrived, he had just waken up, and I was greeted with "Daddy." Music to my ears. He's still pretty low on energy, and coughing from time to time. However, he's on just a whif of Oxygen and saturating in the high 90's. I anticipate he'll be off O2 altogether in the next hour or two. The next step is to restart his feeds via the nasal feeding tube. Once he's off O2 and can tolorate feeds, they'll probably discharge us. He's still in some pain, which we're managing w/ Tylenol. You can tell by listening to him that it's uncomfortable to talk. He's in good spirits though. Please continue pray for a smooth recovery. The docs told us yesterday that this was going to be a rough week, so please pray for Julian and Stacy both, that they remain in good health. Julian is out of the operation and in recovery, however is on high oxygen and his breathing is labored. Please pray that he recovers soon from the operation. His lungs, having been born hypoplastic and underdeveloped, have had a tough time this surgery..got to go. Please pray. Ok, I sent the update too soon. Julian has an emergency tonsillectomy/adenoidectomy tomorrow, he is being admitted tonight. The ENT doc took one look at his tonsils, and although they are just "enlarged" and not necessarily "inflamed" he wants them out. He said he doesn't even need to do the sleep study, he wants them out. There is a slight chance he may be developing PTLD which is Post Transplant Lymphatic Disease...it mimics Lymphoma and attacks the lymph tissues around the body....the tonsils being the first to be attacked usually...but we are hoping (of course) that he doesn't have this rare disease. The kidney docs will send the tonsil tissue to pathology and get it tested, but they are quite certain it is NOT the case, since Julian does not present any other symptoms associated with this illness. His labs would have shown the presence of PTLD along with other physcial symptoms like unexplained fevers, easy bruising, other enlarged glands, and he has none of these. Other than that we ask for prayer that the tonsillectomy goes well and there are no complications (including PTLD). We will keep you updated through the weekend. Stacy is in with the kidney docs as I write this, having already visited with the ear/nose/throat docs earlier this a.m. The ENT docs want to remove Julian's tonsils right away. The tonsils are not inflamed - only enlarged - but such a condition may lead to other problems down the road (not the least of which is the fact that he can't breathe properly when he sleeps). So, tomorrow morning, Julian is having his tonsils removed. Stacy and the docs are still working out logistics as far as when he'll be admitted, etc. Sometimes it's hard to procure a bed at Stanford Children's. We'll keep you posted as we're able. In the mean time, please pray with us that everyting goes well with tomorrow's surgery. As far as his regular kidney appointment goes, Julian's labs look great and all other factors indicate that he's doing great. As the docs tell us, "boring." Just the way we like it.